In today’s tutorial, I am going to explain to you how to lock Android apps with face and fingerprint. In my previous article, I shared the way that how you can control your Android device with face. But, this feature is for your phone’s security. Phone manufacturers are developing different techniques to protect your smartphone’s privacy. Nowadays, you can unlock your Android phone with Password, Pin, Pattern, Fingerprint, Voice and even with your eye’s retina. Most of the smartphones have fingerprint scanner which is easy and quick to unlock your device. But, these features are only helpful to protect your phone on the initial stage. 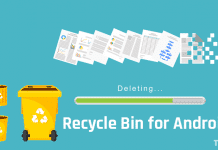 You use a lot of apps with contains your personal data, like your photos, videos, contacts, credit card information, etc. If your phone is unlocked or if someone asks you to use your phone to check a website then he or she can quickly look over your privacy. To protect user’s personal information from friends and family App Lock came into existence. I have already shared the list of best Applock for Android to protect your phone’s apps from unwanted access. I have tested many app locker apps, and most of have the feature to lock and unlock apps with Password, Pattern, and Fingerprint. Finally, I got IObit Applock which uses face recognition unlock technique along with fingerprint scanner. 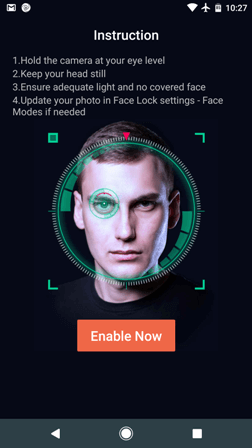 Let’s know how to use IObit Applock to unlock android with face recognition. How many people have situations when someone attempts to sneak on our privacy while we aren’t noticing? 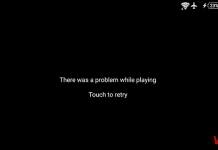 Well, how many of us have small brothers, brothers or cousins who always request our mobile to play games? I think many people come in such circumstances where our solitude arrives to risk. To protect your privacy from your friends and family you can use IObit Applock – Face Lock & Fingerprint Lock. It can protect your privacy and download data by locking any apps, system settings and switches on your own Android phone and tablet with a secure pattern or PIN code. You are no longer need to worry about sensitive information been tried by other people or system settings messed up by kids. 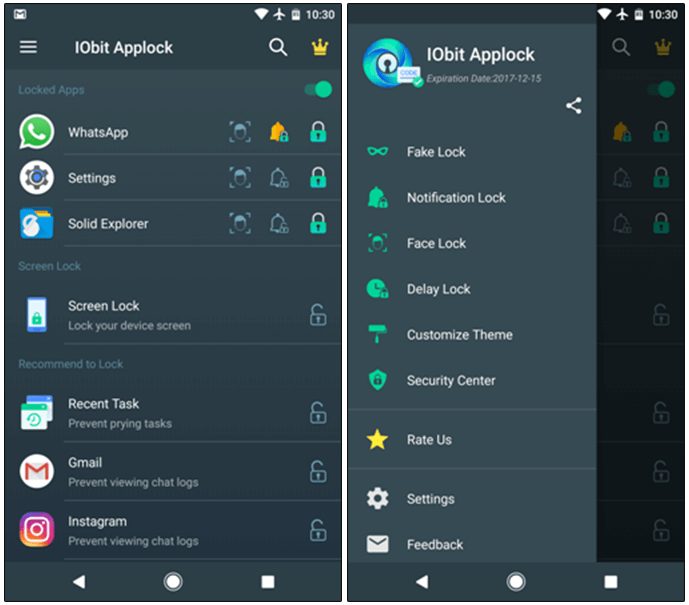 IObit Applock: Face Lock & Fingerprint Lock has a lot of features that can beat any other app lock available on the Google Play Store. Let’s have a look. This is a very nice additional security feature that you may use to fool your friends, so they don’t glance into your locked programs. So should they open a locked program, they’ll be greeted with an imitation lock till they get to the actual lock screen. IObit comes with four default fake lock screens and an additional two fake locks which come with the Pro version of the program. From the above six fake lock screens, I like the force stop cover. 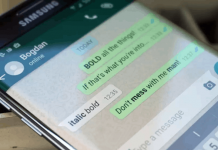 Suppose you have locked Whatsapp and someone will try to open Whatsapp, then he’ll see a message “Unfortunately, WhatsApp has stopped.” This feature is enough to fool your friends. As like the name, it prevents the users to see your messages via phone notification. Most of the social apps use the notification option to preview the sender’s message shortly. You can use this feature to lock the notification messages. Not only the instant messaging apps, but it can also lock the notification of any app. IObit Applock uses Artificial Intelligence to recognize your face and use it to protect your apps. You just need to enable the Face Lock feature and you are ready to go. This is a unique feature that should available in every app lock. When you are aware that you’re alone and nobody will use your phone for a little while, you may use the Delay Lock feature. This does is after you’ve unlocked an program, you may select the lock moment. For those who have set the timer to 20 mins, when the program is unlocked, then IObit will ask you to enter your password every 20 mins. So over the 20 minutes, it is possible to open the program n few times, along with the program will not ask you for your password. You can put a different timer for every program. Do you want to guard your phone by applying extra security, then this is the best choice for you. If someone inputs the wrong password three times, the intruder’s Photograph is Taken secretly and stored here. The intruder’s selfie could be auto-sent to you in case you bind your email into IObit Applock first. Every app has an icon to open it. Obviously, the IObit Applock – Face Lock has the icon, but there is a twist. If you don’t want to make the people know that you are using an app locker to protect your apps, then you can use this feature. You can replace the original IObit Applock icon with Weather, Alarm Clock or Calculator. In my phone, I have replaced the locker icon with a Weather icon. IObit Applock: Face Lock & Fingerprint Lock runs in the background like many other apps. It has an option to save your battery. It claims that you can save 50% power usage by enabling this option. As facial recognition program gets increasingly more complicated, it is also going to become increasingly cheaper – appearing on a number of our digital devices. While not foolproof – just yet – that the Face Unlock feature constructed to a new Android cell phone does fairly well. Android KitKat and above versions have the option to set your Face ID to unlock your device, but you can’t use this feature to lock Android apps with face. 1) Open IObit Applock and complete the initial setup process. The setup process is super easy, that’s why I am not going ask details. 2) Tap the Menu icon and select Face Lock option. 3) After that tap on the Start button and make the IObit Applock to download the AI Database. 4) Once it downloaded, it’ll ask you to enable this feature and scan your face. 5) Now you can lock your Android apps with face. Make certain to have appropriate light onto your face so the program can correctly ID your face. This is a really great feature to have, but it can’t be utilized in each circumstance. You can not use it during the night or sometimes where there is no suitable lighting. This was all about how to lock Android apps with face using IObit Applock. If you are looking for an applock with better security, then this is the best app lock for you. This app is available in both free and pro versions. To unlock all features purchase the pro one. If you like this post, then don’t forget to share this with your friends.